And so, last week, the time did come for the bunny to make their way down to the maternal warren for Yuletide, where a chasm of cellular signal did most grievously interfere with the casual plan to rendezvous for dinner. ^_^; But then, it seems to be a rule that all good pubs must have ropey cellular service, to the point where there's enough to place the call, but not enough for any actual voice data to pass. Which is how I managed to spend over half an hour trying to arrange a taxi for her to join me where the bus had (conveniently =:) let me off, at a pub I'm especially fond of, with food that's quite simple, but really well done, lively atmosphere, and a bevy of great local ciders on offer. Nonetheless, she was eventually safely delivered, and we did feast upon their chicken, gammon, and leek pie both, with hand cut chips, and peas. Like I said, simple fare, but absolutely delicious - packed with chunks of chicken breast, pepped up with little flecks of gammon, and that nice edge of leek in a creamy sauce. We returned the next day as well, where I enjoyed beautifully intensely flavored beef cheeks with tagliatelle, though I admit I needed to add a tiny bit of salt and pepper, after which I felt it just right. I finally got to see Albert Nobbs, a veritable tour de force by Glenn Close. I shan't say more, as much of the film rests on the strength of the performances, but I'll happily recommend it. Autostraddle published a magnificent list of longreads written by women (ie at least 3000 words), covering a huge variety of topics, courtesy of many venues, including a few from themselves. 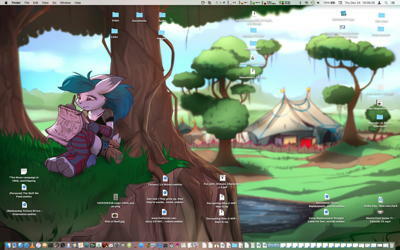 I changed my background image. ^_^ Not a huge deal, but the last time I did so was somewhere around 2009. The newcomer is Noben's rather delightful "Art of the Carnival", featuring a thoughtful leporine artist. It might take me a little getting used to, with the dominant hue now green rather than blue, but.. yes, I'm pleased with it. It belongs. Et voilà! I am, of course, delighted that the Lewisham and Greenwich NHS Choir topped the charts with their "A Bridge Over You", sending a not very subtle hint to the Conservatives that yes, the NHS really is a wonder that should be far better funded, not hived off into private hands. Fun little fact in BBC News' obituary for Lemmy: "Motorhead went on to sponsor the Greenbank under-10s B [football] team, which had the internationally renowned band's name on their shirts along with the band's motif - a skull named Snaggletooth. The team also ran out to the band's famous Ace of Spades track." There's one quite reliably active warren on my usual local rabbiteering trail, with a frustrating caveat: there's no good visibility. I can get a reasonably clear view (but still with the odd branch and bramble that can get in the way while tracking for a shot), but a bit too far away from them for good photos; or, I can be on the trail running behind them, but with a thicket in the way, mostly obstructing any view. But, I was lucky enough to have one or two within the thicket itself - and thanks to the magic of a comparatively wide aperture lens, I was able to shoot through it all, and still wind up with a reasonably clear photo. ^_^ I'm delighted how close they let me come, despite them knowing very well that I was there. That is an outstanding picture. Wow. I've set my computer desktop to change pictures every fifteen minutes, drawing from the iPhoto library and it seems to be finally using all 60,000-or-so pictures. (It'd been drawing from a weirdly small subset for a long time before.) Since then I keep getting these rushes of memory as something I'd forgot is back on-screen. I have one directory for wallpapers and another for screen savers, the wallpaper directory has only landscape-oriented shots. On my Macs, they randomize wonderfully. On my Win 7 PC at work, their program has a terrible randomizer. It's astonishing how predictable it is to see the same shots day after day when there are so many hundreds to pull from. So much good stuff, as ever! Also especially dug the video link and your new BG ! I hear "slack" and think "slacker." But it was a very creative commercial: I loved the stereotypical Sloth, and the Beaver (who was either sharpening a pencil or just chewing a stick). The photo is magical. 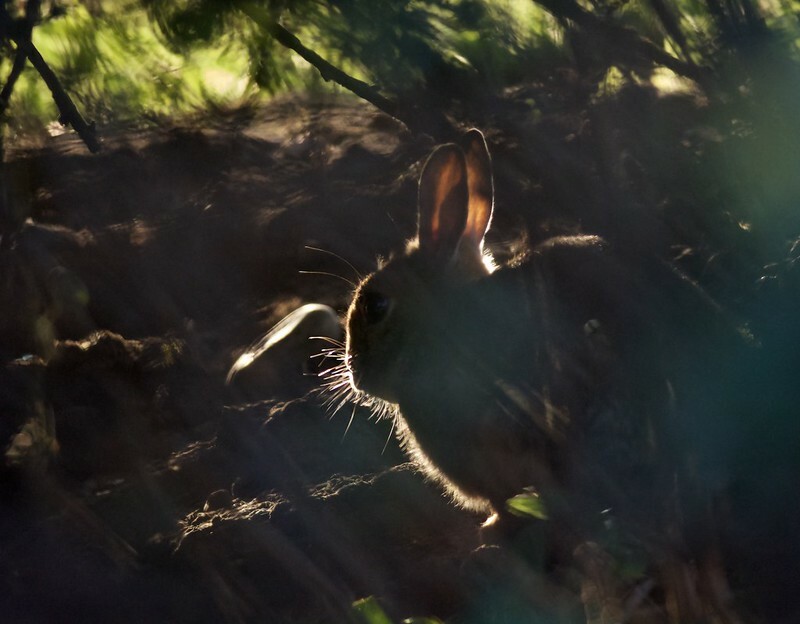 I sometimes believe that our rabbits can sense my inner bunny, but anthropomorphism aside I think they just don't see me as a threat as I lumber along the trails talking to them as we pass one another.